Not all printing services are created equal. When you work with Instant Imprints®’s print shop, you’ll be getting the best quality prints in the industry, with a quick turnaround and fair pricing. The quality of your printed marketing tools speaks volumes about your brand, so it’s worth investing in flawlessly executed print goods. Office printing and second-rate services simply can’t match the quality and professionalism that you’ll get with our print shop. Although you may think that office printing is more cost effective, the truth is that printing at home or in your office usually requires several revisions that end up costing more. With Instant Imprints, you’ll be sure to get the job done right the first time around. Our Image Experts work to ensure that they fully understand your specifications and goals, so you can rest assured that you’ll have a professional looking final product without the need for costly revisions. Whether you need brochures, flyers, business cards or a poster printing service, our print shop has the flexibility to meet your custom printing needs. With a wide variety of paper stocks, sizes and styles, your business will be presented in a professional and eye-catching new way. Our Image Experts can help you design the perfect piece of promotional material so you can be proud to represent your brand. Our Professional Printing Services save you time with our quick turnarounds. After consulting with one of our Image Experts, you’ll have the peace-of-mind of knowing that your print job is in good hands. We save you the hassle by handling all of the finishing and formatting, so you can relax. When it comes to printing, leave it to the professionals at Instant Imprints. Do you have a vision for your flyer or business card that you need help articulating or putting onto paper? Our Image Experts are here to assist you in crafting a design that you’ll want to spread all over town. Between color choices, scaling, font choice and image content, there is a lot that goes into creating the perfect custom print. We’re here to simplify the process by understanding your vision and making it a reality. 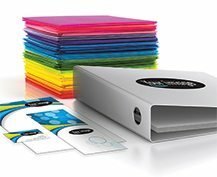 Professionally printed promotional material gives you the opportunity to use a range of textures, colors and formats that are unavailable to the average printer. You can dream big with a variety of customization options available to you. Our Poster Printing Service is sure to create eye-catching posters in a way that is unique to you and your brand. The sky’s the limit when it comes to your custom printing options. When you work with our print shop, you’ll be able to scale your production in a way that would be impossible in your office. When it comes to flyer printing, quantity is king, so that you can reach more hands and eyes with your brand message. We can help you to scale your marketing plan to meet your brand visibility goals. With the latest in printing technology, our print shop puts state-of-the-art printing services at your fingertips with fast turnarounds and affordable pricing. One of our core values is that we get your job done right. This is a promise that ensures you’ll be happy with your finished product so you can focus on distributing your promotional material and taking your business to the next level. Visit your local Instant Imprints center today to put yourself on the path to the perfect print. Print Services are also available at our BizCard Xpress centers.